You're going to have to come back on 5-3-11 for my full review, but I will tell you right now, holy crap, did I love this book! The best way to describe it is The Dresden Files meets religion. 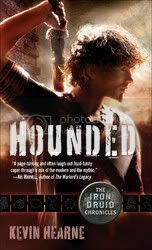 But don't think that comparison means Kevin Hearne is a copycat writer; he has a style and story all his own. His rather unique take on the pantheon of gods from religions all over the world is quite clever. I put my review up already I just couldn't wait...and I am super eager for the next two books in the series!